Home Health Care | GeriatriCare Management, Inc.
"...My mother suffered acute kidney failure... Before I knew it, I was put in touch with Stephanie. She called me right away, was at the hospital making an assessment the next day, reviewed the chart, talked to her doctor, inspected two nursing homes, dealt with the hospital's discharge coordinator and made very well informed and important recommendations. All of these things were impressive and I am extremely grateful for everything she did." We have partnered with one of the largest, national, full service, licensed Home Health Agency’s in the United States, that provides a broad range of non-medical, supportive services ranging from meal preparation and light housekeeping to taking a client to doctor appointments and assisting with bathing and dressing. All the caregivers are employees of the agency so all their payroll taxes are paid by the agency. Placing security and safety as a priority, the caregivers are bonded, covered by worker’s compensation, and liability insurances. All potential employees go through a rigorous screening process with criminal background checks. Also require from all potential caregivers, are, proof of automobile insurance, up-to-date TB tests and each applicant’s personal and professional references are checked. 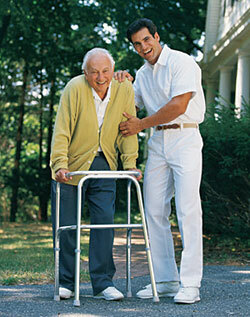 Caregivers are oriented and monitored by an RN case manager who provides and implements the plan of care. The selection process assures our clients’ peace of mind and the security of knowing they have a professional team working for them.